Municipalities across Michigan and the nation are facing mounting, unfunded pension and retiree health care liabilities. Factors like past government practices and rising health care costs have led us to where we are today. Now, these legacy costs threaten the quality of life in communities across the state by crowding out crucial municipal services such as police, fire, ambulance and sanitation, and jeopardize the well being of the retirees and employees who depend on these benefits. 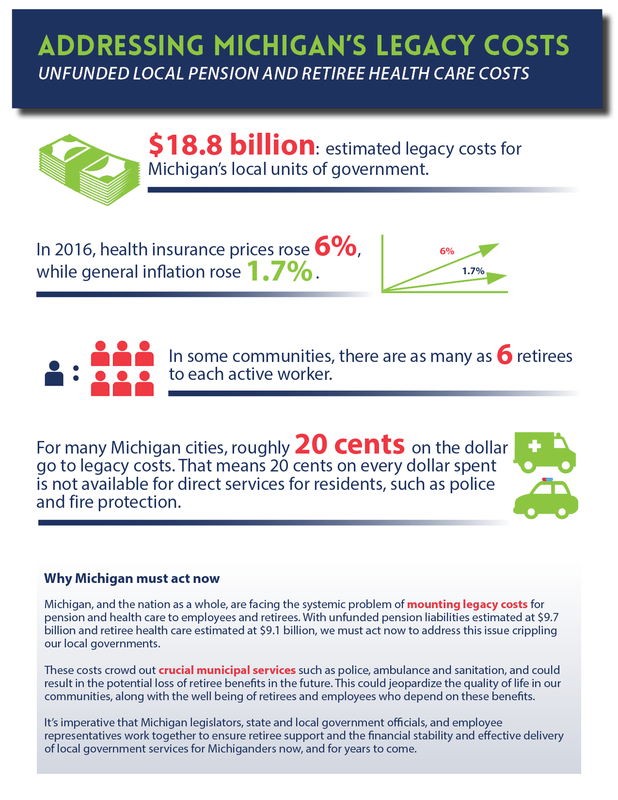 With the legacy costs for Michigan’s local units of government estimated at approximately $19 billion and communities struggling to fund these benefits to retirees, Gov. Rick Snyder established a task force to get out ahead of this looming issue before it becomes a crisis. Comprised of legislators, state and local government officials and employee representatives, the Responsible Retirement Reform for Local Government Task Force recently prepared a report of recommendations for the Governor that focus on addressing Michigan’s mounting local pension and health care costs, ensuring retiree support, and providing more financial stability and the effective delivery of municipal services. While there were some issues task force members did not find agreement on, they found consensus on key reforms that call for greater reporting and transparency, the development of a fiscal stress system, and new funding requirement necessary for long-term stability. Acting on these growing liabilities now is the responsible thing to do. Though it is a complex and long-term issue with no one-size-fits-all solution, it requires prompt and meaningful action to prevent it from getting any worse. Given that some communities have as many as six retirees to each active worker, and roughly 20 cents on the dollar are going to legacy costs, it’s critical that we explore these proposals, continue the dialogue and work with the Legislature to address Michigan’s growing legacy costs. The task force’s recommendations are an important first step in determining how we can best reform pension and health care in Michigan’s local governments, but we must continue to work together to ensure retiree support and the financial stability and effective delivery of local government services for Michiganders now, and for years to come.